Sushi and Sashimi has fast become a popular staple around the world, In Japan alone it is 14 billion dollar industry. From the smallest of delis, the finest of Japanese restaurants, smallest of take out’s sushi can be purchased almost everywhere. Notably it make s a regular appearance on the menus of our corporate aircraft and Corporate FA’S are regularly tasked with serving some of the finest Sushi and Sashimi. But what do we know about this type of food that we have all come to enjoy so much? Sushi is a Japanese food made from vinegared rice topped with other ingredients. Originally, sushi was made from fermented fish with rice preserved in salt, this was a staple dish in Japan for a thousand years until the Edo period when modern sushi was developed to be a type of fast food. Japanese Sushi differs to western sushi’s, generally it only contains one type of fish or vegetable unlike our westernized versions. The California roll we all have been accustomed to being one of the most common examples. Salmon was not originally used for either Sushi or Sashimi, in fact this was introduced in the 1980’s by the Norwegians, it is yet another western addition. There are literally hundreds of types, but some common menu options include, Ama Ebi – Sweet shrimp (raw), Ebi- Cooked shrimp, Hamachi– Yellowtail, Ika– Squid, Inari– Fried tofu wrapper filled with sushi rice. Maguro– Tuna. Sake– Salmon. (Not to be confused with ‘sake,’ the alcoholic drink.) Tako– Octopus. Tamago – Egg. (Normally sweetened with sugar and cooked) Tobiko– Fish Eggs and Unagi– Eel. Is made from the finest cuts of raw fish. As the fish and seafood used in Sushi and Sashimi is eaten raw, the fish used is of a far superior quality than the type fish that would be used for cooking. Sushi Chefs are able to recognize the better quality suitable fish by the firmness, colour and other attributes. The most prized part of the fish is known as the fatty cut, especially in blue fin tuna (the Toro – middle). 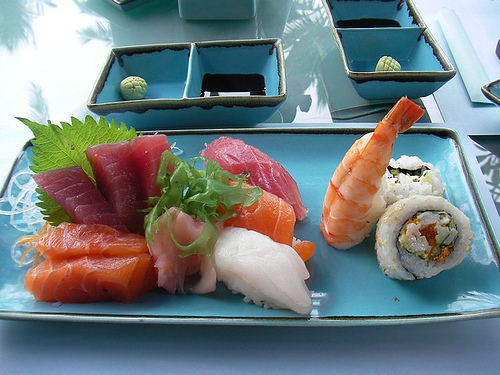 Sashimi is often eaten first so the other flavors do not detract from its purity. Soy sauce, Japanese Horseradish (Wasabi), gari the sweet pickle, helps to cleanse the palate and aid digestion. Sushi can be dressed with seaweed, grated carrot and decorative items. The traditional way to separate items was using baran leaves, (the green plastic leaves you find on your take out sushi represent the baran leaf). Green tea such as matcha and the premium varieties are often served with sushi. The classic way to serve sushi is on a fresh bamboo leaf. Omakase sets are either served one or two pieces at a time in this way, or the sushi arrives together on a wooden or ceramic platter. Conveyor style, kaiten sushi (sushi train) has grown in increasing popularity worldwide. An itame will have already dressed some of the sushi rolls depending on type with a dash of horseradish. Heaping the wasabi into the soy is not necessary and may offend the chef, it will also detract from the taste of finer cuts of fish found in high-end establishments. Traditionalists will also tell you that sushi should be tuned upside down and dipped in the soy, so only the topping is covered and the rice does not absorb too much soy sauce and break up. The fish used for Sashimi legally has to be frozen to kill any parasites also the freezing prevents oxidation, which gives fish such as tuna, its brighter colour. Sushi and Sashimi are high risk foods, great care must be taken if collecting the sushi, it must be chilled for and during transit below 4C/39F. Traditional sushi is made with the rice being slightly warm, which has the potential to encourage rapid bacterial growth in particular Bacillus Cereus a spore forming bacteria, prevalent with rice and Staphylococcus auerus a common pathogen, both can cause rapid acute food poisoning. Always ensure the sushi is received cold and provision to keep it chilled, sealed and at a safe temperature in flight has been made. Finally, there are so many varieties get out there and enjoy!